Roatzsch-Griesenbeck-Arciniega house with the Alamodome in the background. 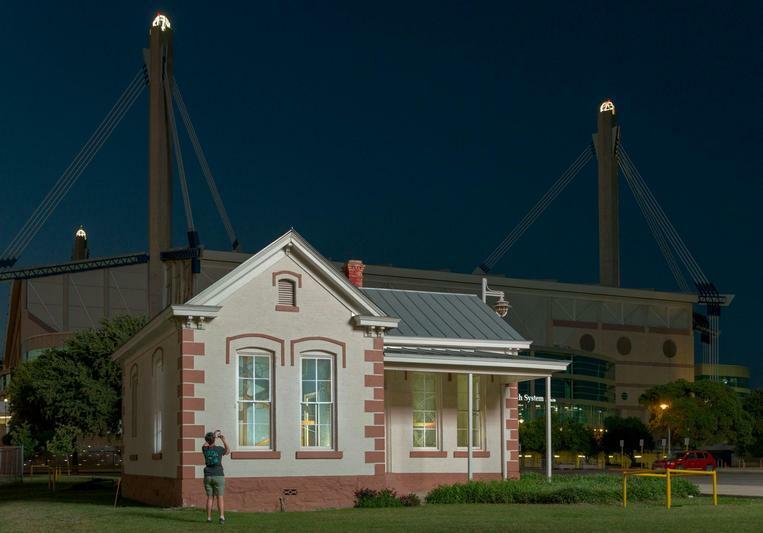 "We are in a small historic house on the grounds of the Alamodome,” artist Ansen Seale said. “It's owned by the city, and it's a historically protected property." This historic home isn't the art installation, though. The art is inside. The installation is called the “Tricentennial Clock,” but its name is just a byproduct of the year it was made. Seale was looking for a tricentennial project, and he knew about the house. "So we approached the city, and they thought it was a great idea,” he said. “They've been trying to find something to do with this house for many years." While you can't get in the house to examine the clock by hand, the windows reveal it all. And Seale says once the sun is gone it's particularly interesting. "At night we have lights that shine through it, and they create shadows and reflections on the peeling paint on the walls," he said. “People can come here anytime. The parking lot is usually open." As for the clock itself, Seale said it took roughly six months to build, and "it's a very simple clock. It's a very old technology, probably 500-year-old technology. “Gears, chains, weights, pulleys, and the indicator for the time — the beating sound comes from the pendulum and the part of the clock called the escapement, which allows the energy of the weight to escape very slowly." 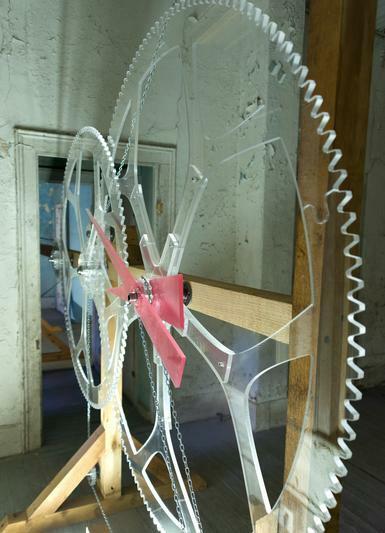 Seale says this peculiar design is called an "exploded clock." “Normally, with a clock, you just see the face, but with this, the whole length of it — 25 feet — is exposed and made out of plexiglass," Seale said. There are eight plexiglass flywheels as wide as 5 feet in diameter. And the large structure that supports the clock is made of a fragrant wood. "Yeah, it's a Texas cedar and smells really good in here. I like a cedar closet," he said. While Seale's installation is a permanent one, other pieces will be installed there will be featured on a shorter timescale. "The whole project is called the Jewelbox project. And we're going to invite other artists to come in and put in installations, probably lasting about a year each," he said. "We're thinking of perhaps light artists or artists that use projection to project onto the walls." Seale sees the house as more than just a vehicle for his art. "I'm interested in the idea that the building is as much a part of this installation as the clock,” Seale said. “So the building is protecting the clock, but, in a way, the clock is protecting the building. It's giving it a job. All buildings need a job."